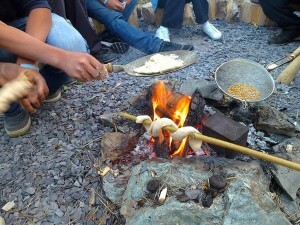 A campfire on a summer’s evening in a beautiful place really has to be one of life’s pleasures. Why not add to the fun by popping some corn next time ? You can buy packets of pocorn maize from the supermarket. 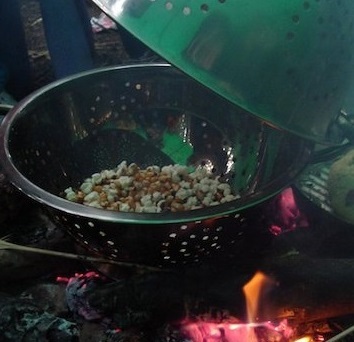 You do not need to do anything to prepare the popcorn just place it in between two sieves or two colanders. 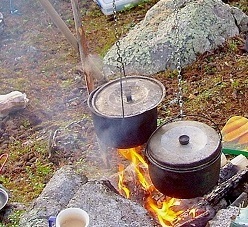 We attached a handle to the sieves as shown above before holding it over the fire. Once it has popped it is ready to eat . Some like to add sugar, salt, cinnamon or other flavours but we like it just as it is. ruthwoolf April 2, 2014 October 25, 2017 Eat out!